In We’re No. 1, The A.V. Club examines an album that went to No. 1 on the Billboard charts to get to the heart of what it means to be popular in pop music, and how that concept has changed over the years. In this installment, we cover Coldplay’s X&Y, which went to No. 1 on June 25, 2005, where it stayed for three weeks. Fact: Everyone loves Coldplay. Another fact: Everyone hates Coldplay. It’s not Coldplay itself that is so confounding—it’s everyone. While the band has a casual reputation that openly derides the music and really everything about it, Coldplay is nearly inescapable. Coldplay is on at Starbucks. Coldplay is in iTunes commercials. Coldplay is winning Grammy awards. Coldplay is on the radio, shoehorned into both alternative-rock playlists and easy-listening rotations, uncomfortably lodged between acts like the Stone Temple Pilots and Taylor Swift. And on Sunday, Coldplay occupied primetime space on NBC, where it offered a pre-taped, hour-long concert special to promote its new album, Ghost Stories. The record was officially released on Tuesday, though presales made it available already in the U.S. Still, its fate on the Billboard charts seems highly predictable. Like the previous three albums by Coldplay, Ghost Stories will likely rocket to No. 1. Coldplay is the closest thing to a musical monoculture that exists anymore—a global, soft-rock phenomenon providing a score for the world, from coffee shops to HBO shows. It is loved, despised, ubiquitous, and tolerated—much like the status quo it caters to. The band’s sound reflects its normalcy. Coldplay’s music is not about esoteric struggles or marginalized concerns; it always points toward universality. It can be quite moving—and is always highly consumable. At some point, everyone who has ever listened to a Coldplay song got a hook lodged into their head—whether it’s the opening strings of “Viva La Vida” or the guitar solo in “Fix You” or the plaintive crooning of “In My Place.” It happened, and it will continue to happen. Hitting No. 1 is just what Coldplay does at this point. But here’s what’s interesting: A Rush Of Blood To The Head didn’t hit No. 1 in the U.S.—yet it’s sold more albums than X&Y, which did hit the top of the charts. The RIAA declared A Rush Of Blood To The Head quadruple-platinum, and X&Y only triple-platinum. There are plenty of good theories as to why this may be—the most obvious of which is that the band was still gaining momentum in the States, and ended up selling albums more slowly over the course of three years. But there’s something to be said for the years between Coldplay’s first appearance on the music scene, in 1998, and its first No. 1, in 2006—years that were tumultuous for both the music industry and the world. Much of the explanation has to do with the confusing nature of Coldplay itself. The band doesn’t have the manufactured pop appeal of Taylor Swift, the smooth and soulful sound of Adele, or the critical approval of Kanye West. Coldplay instead arose with a semi-alternative soft-rock sound in the United Kingdom, then accidentally made it big with the enduring hit “Yellow.” “Accidental” is the right adjective for this band’s ascent; nothing it’s accomplished seems intentional. The sound is remarkably unaesthetic—“aggressively banal,” according to a Pitchfork review. And the career trajectory is a bit wandering, too, seemingly a happy accident. Coldplay came up in the mold of Radiohead, R.E.M, and U2, but without those bands’ respective artistic edge, lyricism, or political leanings, it has made a fortune off of non-intention. Coldplay, especially after X&Y, became a sound more than a band; an adjective, more than a noun. Coldplay is in fact a group of men in the business of making Coldplay continue to sound like Coldplay. It’s possible to make that case for most bands and celebrities, but the difference with Coldplay is that the band members seem just as flummoxed by their popularity as anyone else. There is no swaggering bravado behind the scenes, no rock-star sensibilities. Chris Martin has been forthcoming about his abstention from alcohol and meat and the relatively late age at which he lost his virginity—his marriage to Gwyneth Paltrow was his first serious relationship. Drummer Will Champion plays his Playstation 3 backstage, and guitarist Jonny Buckland purposely kept his guitar-playing a secret from his peers—Martin only discovered it because they were both awake late one night in college. There is a strong sense that Coldplay’s members go to bed at a reasonable hour, presumably after brushing their teeth, and then wake up to a sensible breakfast of tea, yogurt, and oatmeal. Yet Coldplay’s sound is also atmospheric, modern, and haunting; it brought an electronic sound to radio that felt fresh. (It has its obvious rock ancestors, Radiohead, to thank for that.) It’s a touch more edgy than the music that otherwise populates pop music—there’s some synth, some piano, and some complicated guitar. It’s not blurring itself by running the sound through a machine. It is the machine—a very empathetic machine—but one that produces a reliable, big sound that thrums and vibrates and pounds with earnest sensitivity to one thudding bass line, drawing up to a crescendo or fading out poignantly. The band has worked with a number of producers, but there is some obvious, solid talent in its members. The band may be mediocre in certain areas of musical production, but it is skilled (or, at this point, can afford others who are skilled) in knowing just how long to draw out an instrumental hook for maximum emotional effect. The sense of rhythm is unparalleled; so much of Coldplay’s success is attributable to its ability to discern when the drums ought to kick in. And built under that modern sound was a deep-seated fear of the selfsame modern—an anxiety about the technology that makes up the world. It creates a perhaps unintended tension out of the music. “Clocks,” in particular, which was a breakout hit for the band, is nothing more than a piano fugue lament about the mechanization of time—built with technology that wouldn’t work without the precise mechanization of time. Whatever this self-hatred is, it worked. X&Y didn’t hit No. 1 because people liked the album so much; it hit No. 1 because people liked A Rush Of Blood To The Head and anticipated the next installment. Coldplay sits uneasily with their contradiction—but as they occasionally hate themselves, so, apparently, does the generation of adult-contemporary music listeners who dig the band’s music. Coldplay accurately determined that contemporary adults were miserable. By the time its next album rolled around, all those contemporary adults were ready to buy. X&Y debuted amid personal celebrity for Martin; the singer started dating actress Gwyneth Paltrow in between A Rush Of Blood To The Head and X&Y, and they had their daughter around the time the album debuted. The intimation was that Coldplay had arrived—that they’d arrived years ago, in fact. And so X&Y shot to the top of the charts, hitting No. 1 shortly after release. It had the immediate effect of diluting Coldplay’s brand—the songs already sounded similar, of course, but X&Y feels like an undifferentiated mass of guitar riffs and Martin’s wailing harmonies, both funneled through synthesizers where appropriate. Martin’s high-pitched, light tenor crooned through each song, anchored by acoustic chords, riffed with an electric solo, coming to a crescendo in a jangle of piano keys when the drums kick in, and then fading out with an unfinished, haunting trail-off. Before X&Y, this structure felt like something Coldplay used for its most radio-friendly tracks. After X&Y, this became the template that seemingly describes every song. In the face of an increasingly homogenized sound, Martin’s lyrics—which were admittedly never brilliant—began to sound more and more sentimental and treacly. “Part of a system / I am,” he sings on “White Shadows,” X&Y’s third track. And in one of the album’s most famous tracks, he nonsensically affirms to “fix you,” without explaining what that would entail, or how that is even possible. Instead he chooses to describe how someone else is suffering in great detail, which is disturbing enough that it paints “Yellow” in a far less flattering light. Yet, even “Fix You” is preferable to “Speed Of Sound,” which is a clear attempt to replicate the success of “Clocks” without exactly cloning “Clocks.” At least “Fix You” is undeniably catchy, with a defiant guitar solo in the back half that makes up for the sentimentality of the first half. “Speed Of Sound” would more accurately be titled “Wall Of Sound”; the ringtone-ready riffs never coalesce into something beyond noise and into music. 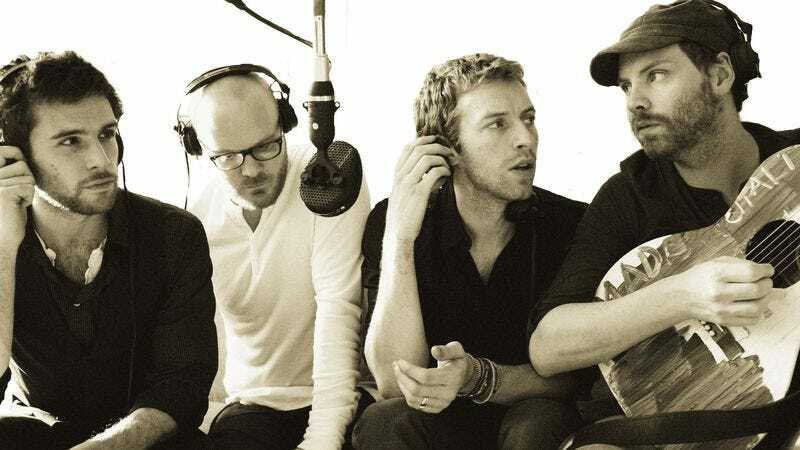 Critical response to the album demonstrates some confusion, in part, because it wasn’t just that X&Y was a disappointing album, but rather that it felt like Coldplay was changing the rules. At first, critics from hip publications derided the band for what they were trying to do; when it became clear that Coldplay was intentionally doing less and less, criticism sort of petered out. A lens that started out comparing Coldplay to Radiohead zoomed out to start comparing Coldplay to other pop acts of 2005—acts like Audioslave, Dave Matthews Band, and Faith Hill, which all joined Coldplay on the Billboard charts. Critics who had supported the band’s music before withdrew their support—Rolling Stone dropped its rating down to three stars, The New York Times was compelled to write a manifesto against the band, and even the positive reviews have some derision built in. Martin himself owned up to the album’s deficiencies, in both Spin and Rolling Stone. It didn’t matter anymore, though. The transformation was complete; the music was secondary to the brand. It was Coldplay, and so it would be bought, and it would shoot to No. 1. “One of our big conversations that we always have in this band is, we don’t see rock & roll as being about coke-taking, leather-trouser-wearing rebellion, because that to us is not rebellion anymore. The spirit of rock & roll is freedom. It’s about following what you believe in and not caring what anyone else says. And if that means writing something on your hand, then you’ve got to write something on your hand. It doesn’t matter if you don’t look as cool as the Ramones—you’re never going to, anyway. So I know that we’ll be ridiculed for this and look stupid for that. But as long as we believe in what we’re doing, we can’t apologize for it. “I know that we’ll be ridiculed for this,” says Martin, one of the most successful musicians of the present day, who has scored this era’s transition from analog to digital, from rock to pop. It is that self-hatred again—and it’s the self-hatred of an entire generation, a self-hatred that went right to No. 1.